I really miss watermelons with seeds. 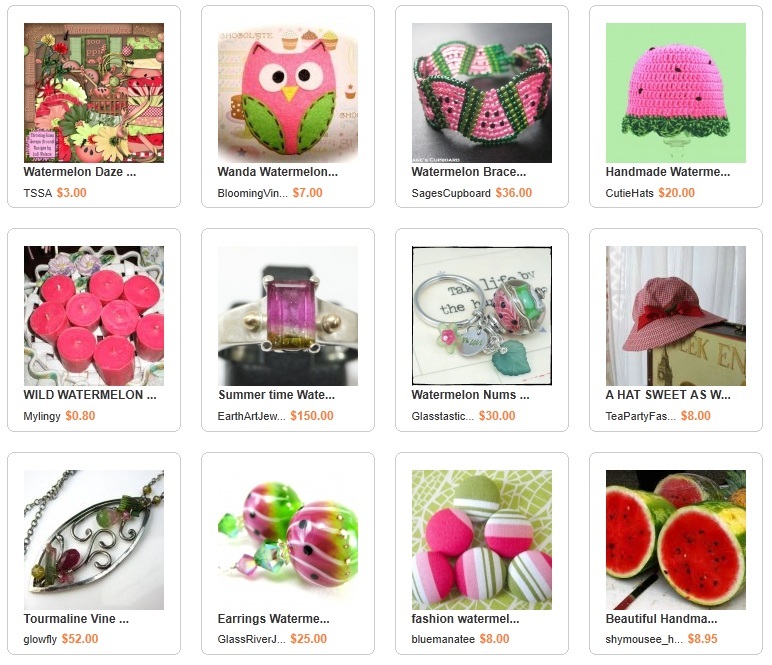 That classic, iconic combination of pink, green and black is a true symbol of summer. There's nothing quite like summer barbeques with friends, family and neighbors. Summer was made for kids. Camp crafts, sandcastles and exploration are forever fused in July and August. 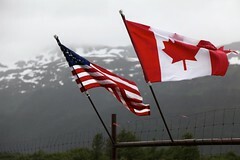 I find it interesting that Canada and the US both celebrate their national holiday in the same week, and our flags share very similar colors. It’s not that much of a coincidence, since combinations of red, white and blue are common on national flags, but it is nice that we share so much in common with our neighbors. We should all get together for a block party some time. For this month’s color trios, I thought it would be fun to take a look at some patriotic palettes in red, white and blue. The trick was to combine beads that would look good with our without the addition of blue. It was a fun challenge, and I think some of the palettes are more successful than others. Working with these colors has definitely put me in the mood for some summer celebrations. Glacier was the toughest palette. 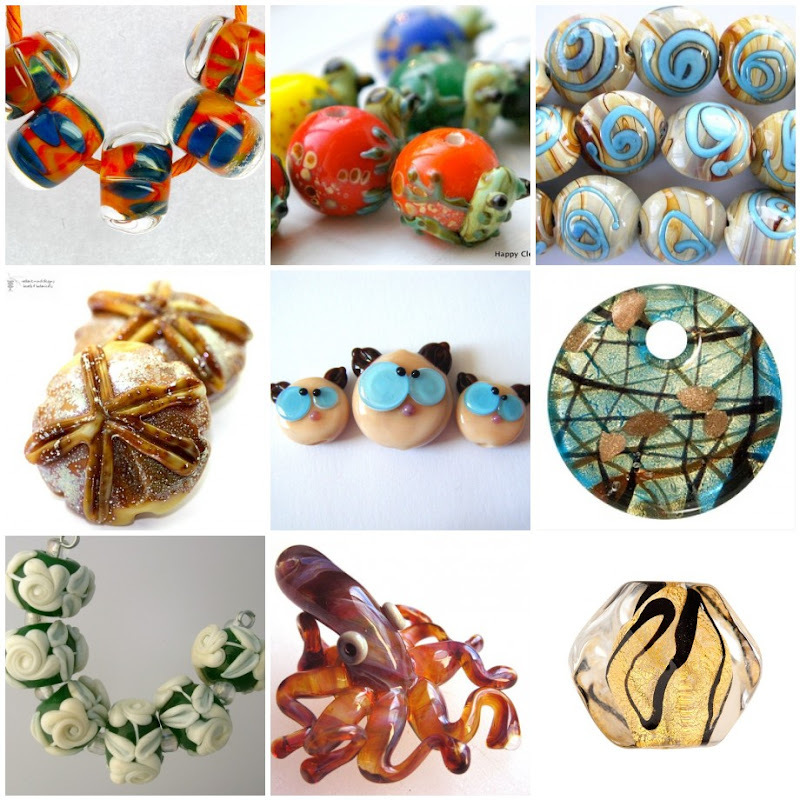 For white, I really wanted to use my last ceramic maple leaf bead, which has a really interesting decoration. The motif seems like a perfect marriage of pine and maple, and it always reminds me of the Great White North. But really nice trees grow south of the border too, so I paired it with opaque red seed beads, and transparent sapphire hex cuts. I’m not sure I like the combination of finishes - an opaque blue would be better, but the colors are very lively. July is a month for Fireworks, so I started the next palette with some silver-lined red delicas, which have a festive sparkle. 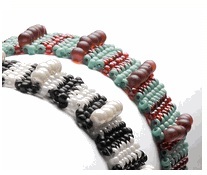 These matched up easily with silver-lined 6/o Czech seed beads for white. Finding just the right blue was a challenge, but I finally settled on cobalt AB druks. Though the base blue is quite dark, the AB finish lightens some areas, and provides lots of shine. The final palette is my favorite, and it reminds me so much of Cool-whip recipes that you often see in magazines around this time of year. Block Party started with a strand of Czech glass rice beads which are so pretty that I have yet to find a project that is just right for them. To these I added 11/o seed beads in white Ceylon and lustered blue. It’s really interesting to watch 10 grams of seed beads jump into the air all at once. Luckily, they all landed in pretty much the same place, so clean up was easy. It’s time to announce the winners of this month’s giveaways! Congratulations to Jenny and Sally, who were each drawn by Random.org. And I’m happy to announce that the exotic beads will actually be accepted at the post office, because mail service is now under way again in Canada. I know all of my fellow sellers are breathing a huge sigh of relief. Let’s get back to business as usual! 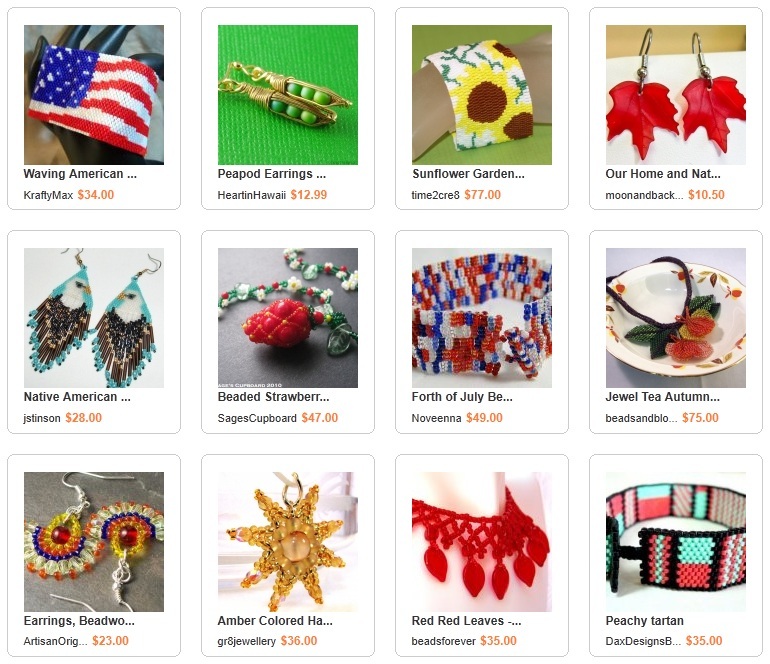 For this month’s bead giveaway, I asked what your favorite inspirational culture or time period was. I think this poll was the most varied yet, and I loved everyone's answers. Jenny was pretty emphatic about the 80’s! I can certainly relate. 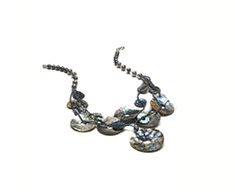 I almost wish I still had some of my old 80’s costume jewelry now. Remember all-plastic hoop earrings? 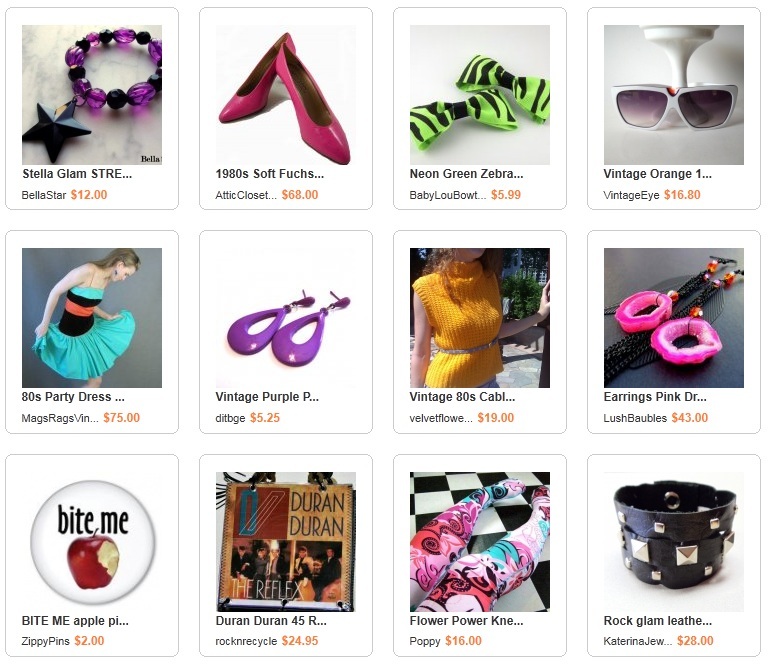 In honor of that most stylish decade, I found these super glam pieces on ArtFire. I really love those stunning pink druzy earrings in particular. 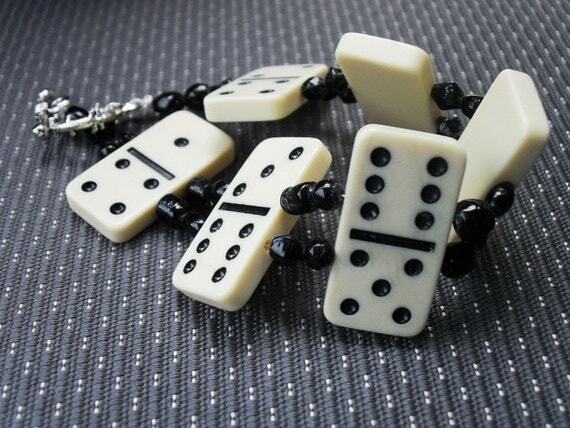 Perfect for a material girl, don’t you think? What’s your favorite 80’s look? I recently participated in a forum discussion about the ethics of beading, and whether or not it’s okay to sell copies of designs made from magazine tutorials, and it really got me thinking. Not about ethics, though. The short answer to that question is no - selling copied designs is inappropriate. I would like to go into more detail on ethics for beaders here on Inspirational Beading, but I’ve been inspired. I found myself recalling all of the projects I tried and tested when I was starting out, and how much I’ve gained from the generous designers who share their ideas and methods with us. 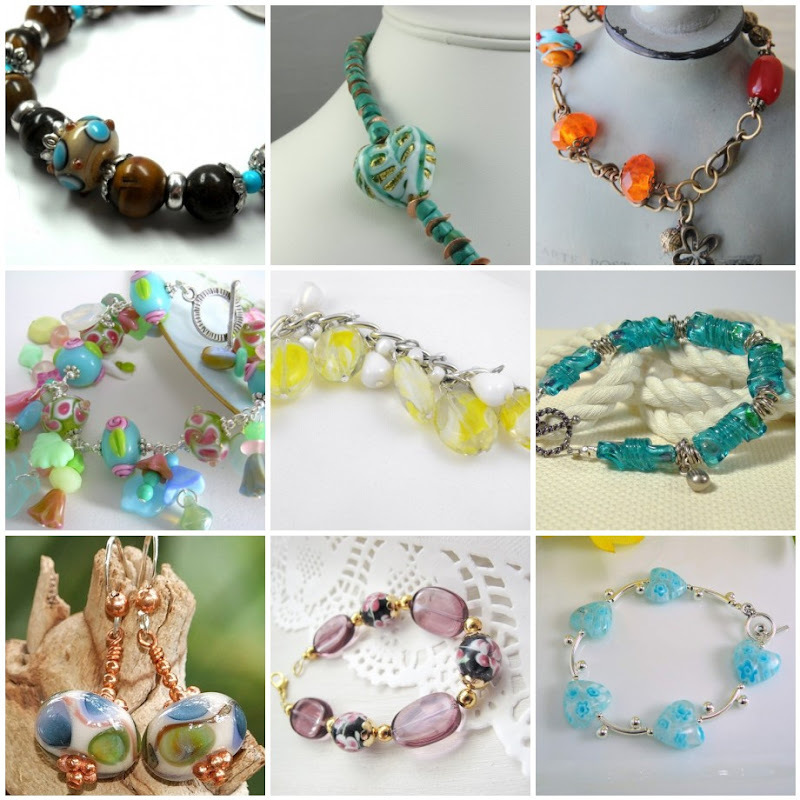 So today, I thought it would be fun to look back at my favorite jewelry tutorials from the pages of Bead & Button. In my mind’s eye, I saw a list of about five or six projects. It wasn’t until I started going through my bookshelf that I realized just how many of these tutorials have helped me to become the beader I am today. The instruction and inspiration is priceless. It’s interesting to look back at the designs that I learned from, and compare them to what I’m making now. Some of them are so different you’d never know there was any connection. I’m going to list these projects chronologically, with as many references as I can. If your local library or literacy center carries back issues of Bead & Button, you might be able to track some of them down in their original form. I absolutely loved the look of this necklace with it’s zig zag pattern. I had already gained plenty of practice with peyote stitch, and I thought this would be a fun way to experiment with different approaches to the technique. 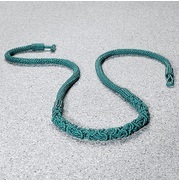 I created several versions of the necklace, with my own pattern variations and accents, and learned a lot about peyote stitch. 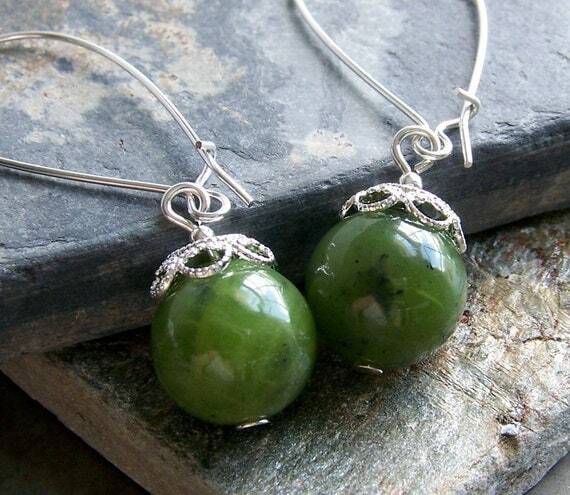 I still have most of my creations, and wear them often in the spring and fall. Like a lot of beaders, beaded beads and sculptural beadwork were high on my learning checklist. This project was exactly what I needed to get started. The rolled felt base is easy and fun to embellish. I skipped the fragrance, and made a few variations to size and pattern. It was one of my first experiments with changing a tutorial to suit my own taste and skill. Bead & Button inspired a lot of my bead and material preferences early on, including a love of donuts. I don’t get to use them often, because I so rarely find them in materials that I’m willing to use. When I first saw this project, I was desperate to try the technique but didn’t have any donuts. So, I used circular peyote to make my own, and stitched a single strand, no clasp version. The idea evolved and grew, and now I’m sharing the technique with my circle peyote pendant tutorial. Even though I now read beading magazines mostly for inspiration - and blogging ideas - I am still most drawn to very simple beading projects. 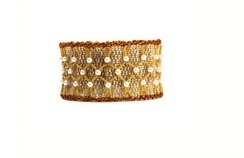 This cuff bracelet was incredibly alluring to me as a new beader. It’s bold and dramatic, but completely doable. I made two of my own, and learned that it’s okay to use lots and lots of beads for one project. I still have to remind myself once in awhile, though. It took a long time to work up the courage to try this project, and I’m so glad that I finally did. St. Petersburg chain is one of my all time favorite techniques, and I use it often. 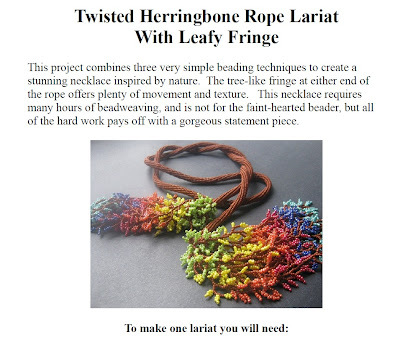 This was also my first ever lariat project, and I’m quite fond of those, too. I think this tutorial has been one of the most valuable and inspiring that I’ve ever attempted and mastered. Although I only attempted this project twice, and it helped to cement my fear of bugles, I still love everything about it. It also inspired my first big necklace - a netted scarf with starfish. 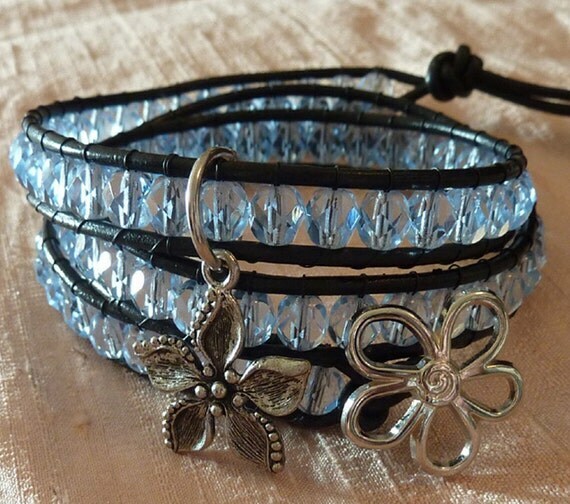 I loved the look of this bracelet, and it really bugged me that I couldn’t make my own, because I didn’t have access to the two-hole spacers used to create the curving shape. So I made my own, and the wavy wedges bracelet was born. When I came across this project, I had only attempted flat right angle weave once, and I hated it. With careful, tight stitches, it still looked sloppy. Even the swatches in the instructions I used looked sloppy. So I had given up on ever using it. This project changed my mind. And because of the interlocking stitch variation, I was able to master RAW, and eventually incorporate it into my own designs. I never fully attempted this project. Freeform beadwork that isn’t open - like netting - still terrifies me to this day. But the project was so inspiring, and I think it helped to encourage my love of seed bead weaving around other beads, and adding accents whether they’re needed or not. I never actually attempted this project. I was dying to, but I didn’t have access to all of the required materials until I had already started making my own designs, and I just never got around to trying it. These stitched butterflies made me ponder for the first time, that question every beader eventually asks. “When will I be able to come up with my own techniques and stitch combinations?”. The answer is pretty simple - when you no longer need magazines to tell you what to do. This is another project that I never fully attempted, mostly because I’ve never had much interest in using beading wire and crimps. I did love the look of the Russian spiral at first sight though, and was happy to learn the technique. It’s so easy to do, and highly adaptable. This project also helped to inspire my secret adoration for Picasso finish seed beads. This is another project that I at first thought might be over my head. I’m glad I ignored that instinct and tried out the embellished tubular netting technique. 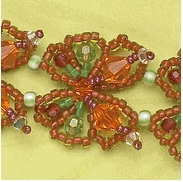 It is one of the most beautiful beading stitches I’ve ever used, and helped to inspire my beaded strawberry pendant. I was so excited to try out this project. I love the look of chainmaille, but I could never try it without using metals. 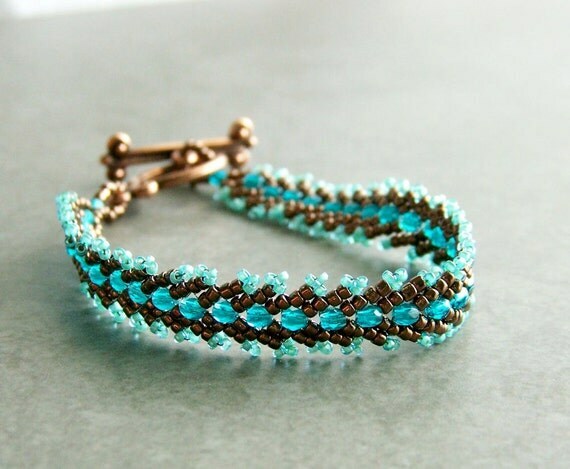 I soon discovered that chainmaille isn’t my thing, especially with seed beads. It’s much too fiddly. When I sit down to bead, I like to work continuously. The fewer times I have to pick up my scissors, the better. I still love the concept, and think every beader should give it a try at least once. And that’s about where my own inspirations took off. I still pick up issues of Bead & Button at the library. Sometimes I’m even lucky enough to be there right when the previous issue becomes available to borrow. 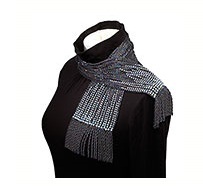 I enjoy seeing what other beaders are doing, and getting a heads up on new materials and books on the market. Believe it or not, the ads are now my favorite part. They are an excellent blogging resource. Do you have a favorite or most memorable magazine project? Way back in 2009, a reader asked me to share the secret behind my Poster Sketch segment, where I shared screenshots of themed Etsy treasuries. I created a handy tutorial for capturing and blogging images of completed treasuries, back when you had to wait in line to make one. A lot has changed since then, including my loyalty, and that of many online sellers. With a new venue, and a new operating system, it’s time for a new tutorial! Today I want to share the techniques behind Inspirational Beading’s newer Collections segment. Unfortunately, the actual widgets are live, and just like the Collections themselves, will change and eventually expire as items sell. Because of this function, it isn’t suitable for individual blog posts, which continue to be visible, archived and cached. They are best used as a sidebar gadget, which can easily be deleted when the Collection is no longer relevant or active. 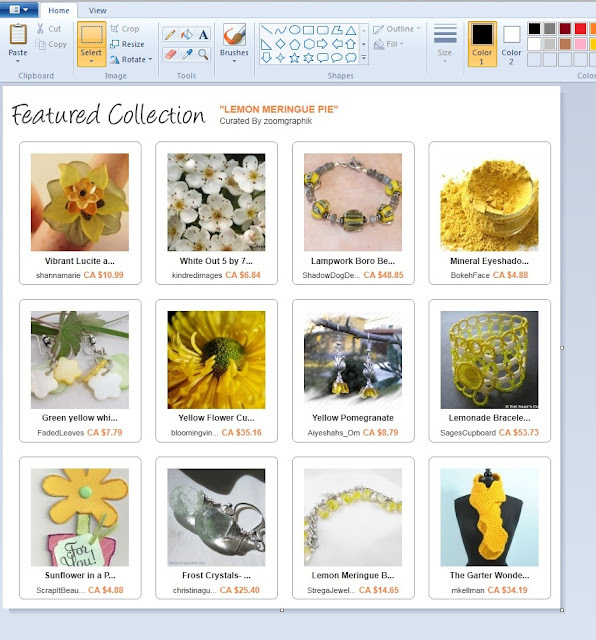 To create a permanent image of a completed Collection, ArtFire front page, or daily email, all you need to do is take a screenshot. Then you can upload your image, and share it on your blog, Facebook page, or website. To snap a screenshot, center the Collection you want to share on your computer screen, and press the PrtScr key at the top of your keyboard, or hold Alt and press PrtScr. Then, open up your favorite editing program - MS Paint works well - and paste in the image by holding Ctrl and pressing V.
In Paint, click the Selection icon, and drag a box around the Collection, then click Crop to remove the excess. You should now have neat image of your Collection. Resize the image if necessary, and save it. To share the image on a blog, you will need to upload it to an image host. If you use Blogger, Gmail, or another Google product, you already have access to Picasa Web Albums, which has tons of storage and is easy to use. Photobucket and Flickr are also good options. Paste in the URL address of your collection over “Destination URL“., and fill in the alt and title fields with a keyword-rich name for your image. 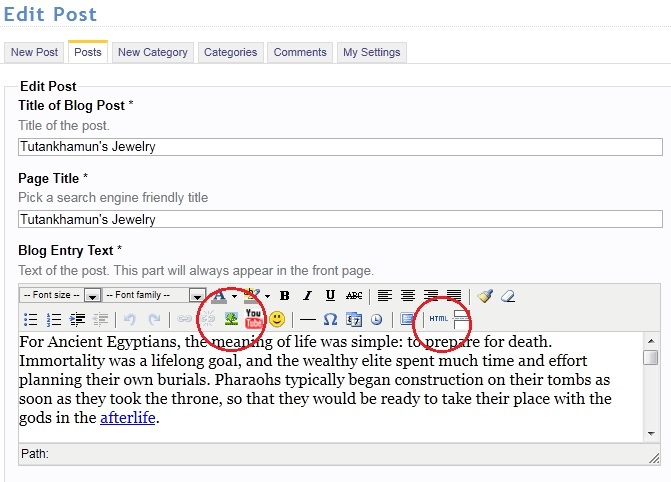 These tags not only create a caption for your image, and default text if it fails to load, but also help search engines to correctly index your pictures and blog posts. 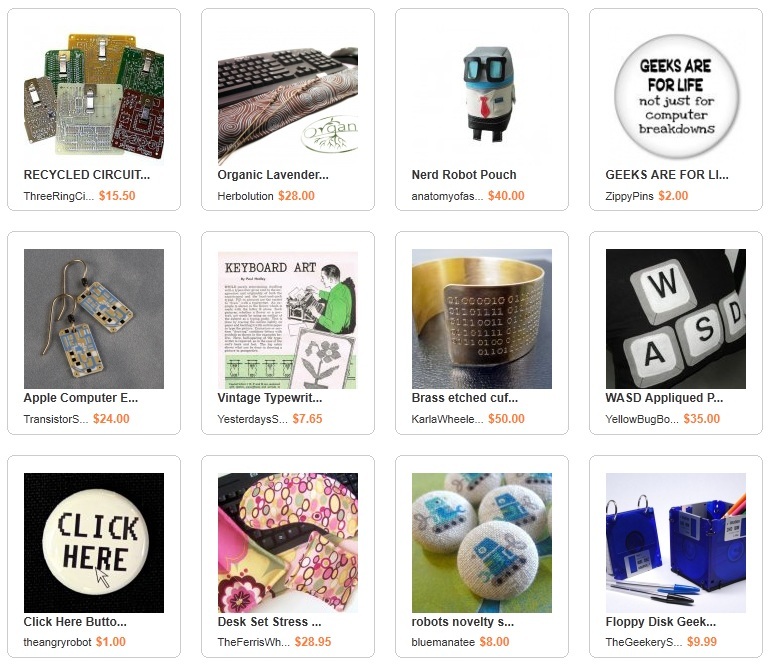 When the Collection has expired, the link will redirect to your My Collections page on ArtFire, so there's no need to worry about dead links on your blog. This code will create a centered image. If you’d like to learn how to wrap text around smaller images, please check out Blogging for Handmade Sellers. 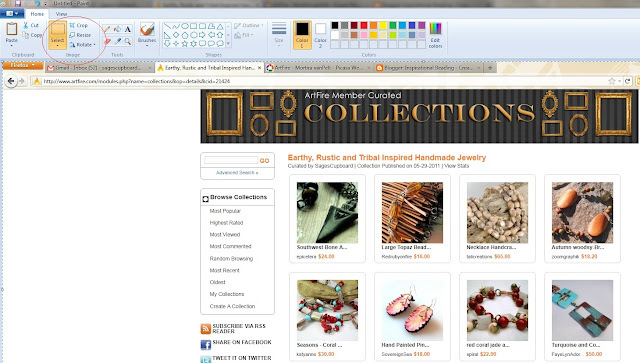 If you are using the built-in ArtFire Studio blog, this code will also create a clickable image for your collection. However, the maximum image width is 500px. 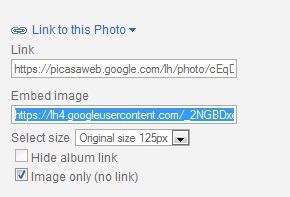 If you are using Picasa to host your pictures, resize your cropped screenshot to 500px wide before you upload it, so you can get the largest possible image. Picasa allows widths of 400px, 640px, or the actual width, up to 800px. Please feel free to copy the HTML above, and save it to a plain text file like WordPad or Notepad. When you need to use it, just copy and paste! With practice, you can also memorize these simple functions, and type them by hand. 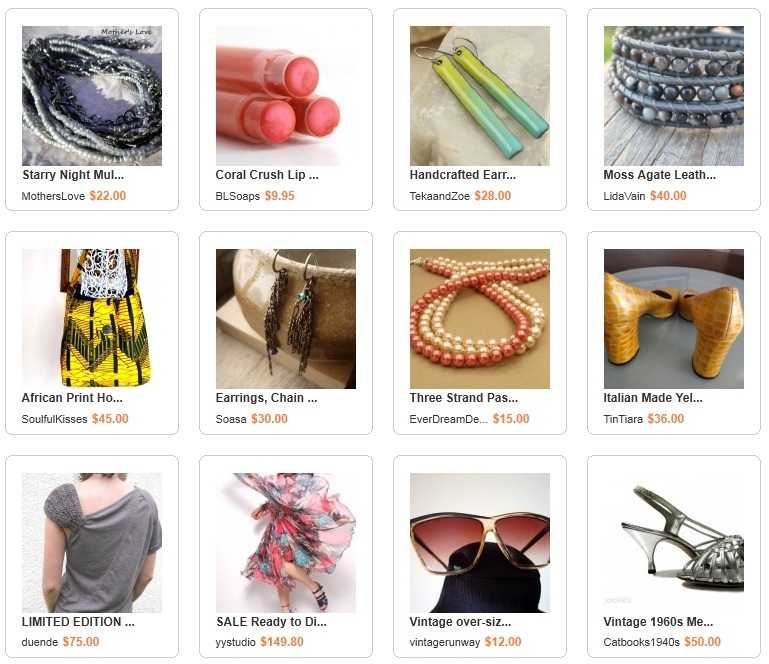 Beaded rings are great instant gratification projects. Making fun and simple ring designs allow you to finish a project in one sitting, so you can have a pretty accessory on the go. 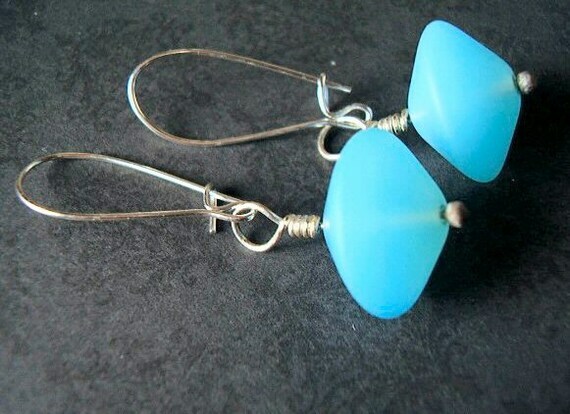 Plus they’re great for gifts and can be the perfect solution to leftover beads. 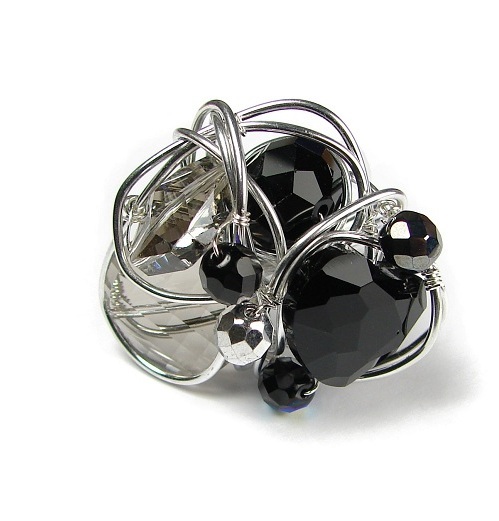 This pretty wire wrap ring project comes to us from the designers at Beads Direct. The jewel-like setting uses crystals and glass for lots of sparkle and endless color possibilities. 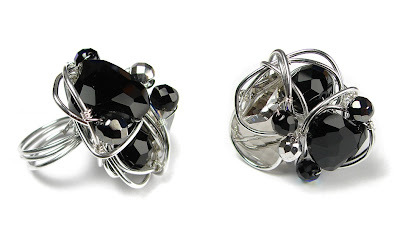 The focal works up in a freeform manner, with simple wraps with each added bead, so you can change up the shapes and placement to suit your taste. 1. Wrap a length of aluminum wire 3 times around your chosen ring shaper or mandrel, leaving an end of approximately 3 cm. Wrap the end of wire around the base 2 or 3 times to hold the coils together. Snip off any excess wire. 2. Cut about 10 cm of silver wire and string on a bead. Holding the bead close to the wire ring base, wrap each end of silver wire around the base to secure the bead. Position the bead where you would like it on the ring, and then start to wrap the heavy wire around it. 3. After a few wraps, string another bead and wrap the wire around the new bead and the previous one. 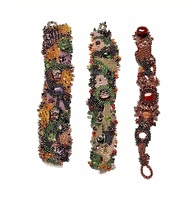 Continue adding beads and wrapping with this method until you get the size and shape you want for your focal. To finish, pass the end of the wire through the middle of the ring and pull it out through a gap in the beads to snip off the excess wire. This week’s bracelet is yet another Egyptian inspired design, but this time it’s a little less literal. It all started with a carved boxwood button in the shape of a lizard on a log. I shared a peek at this little guy back in April, along with a tribal necklace that I entered into this year’s Bead Star competition. I think it’s safe to tell you that I didn’t get past the finalist round, but what a great experience! 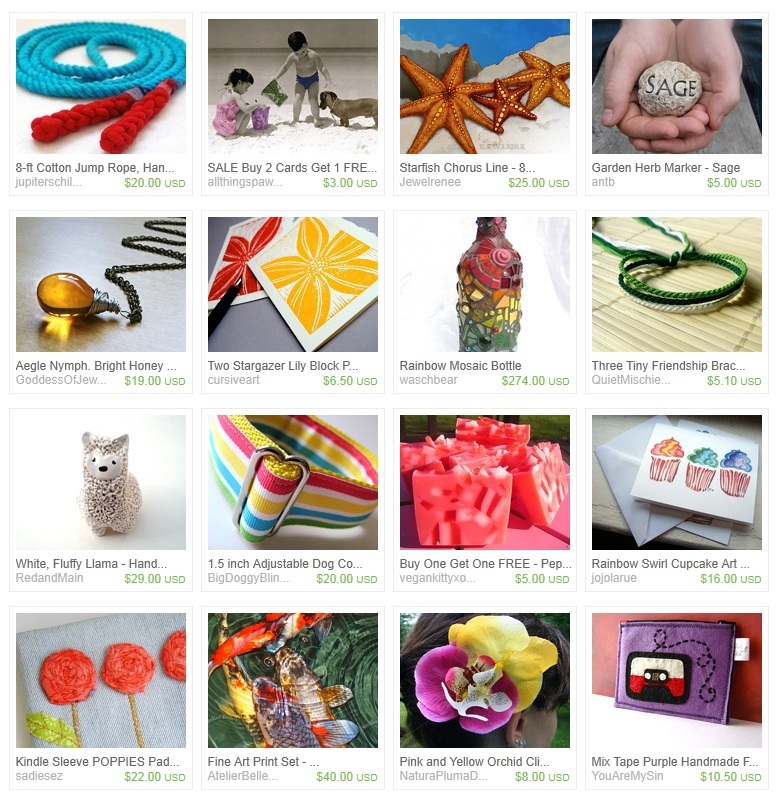 I hope that they continue to have a beadweaving category in future contests. I had always intended to use the lizard button as the focal for a bracelet, but it wasn’t until I started coming up with Egyptian themed pieces that I really got the inspiration I needed to make it work. I made a handful of beaded lotus flowers to surround him on his little log, and worked all of the pieces into a freeform cuff. Perhaps it was because I had a fun necklace idea that I was anxious to get started on, but this bracelet seemed to take forever to make. Freeform openwork RAW is one of the most time consuming stitches ever. Right angle weave is already a lot of work, but when you go freeform, it’s all too easy to forget the basic rules and start making all kinds of wild decisions that eventually have to be compensated for. It’s one of the only techniques that requires constant attention so that the beadwork doesn’t get away from you. 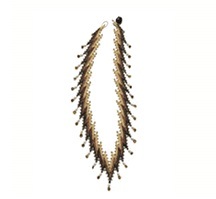 By the time I had finished the leafy fringe vines, I was so exhausted that I put off weaving in the tails until my necklace project was finished. All the work was worth it though. I can’t get over how cute that lizard is, floating along with the water lilies. There are lots of other unique buttons in this style, with everything from mermaids to frogs and roosters at Unique Buttons. If you like buttons it is definitely worth a look!